In the future, dinosaurs will roam. Jack and Hanna fending off a dinosaur stampede. 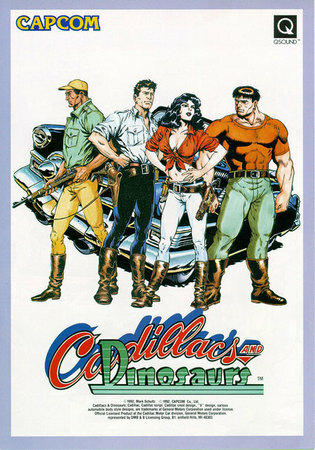 Cadillacs and Dinosaurs, also known by its original name of Xenozoic Tales, was an independent comicbook series created by Mark Schultz. The story follows that the human race had been driven into underground cities to escape the rampant pollution and natural disasters ravaging the surface of the planet. When mankind reemerged after 600 years in the 26th Century in what was dubbed the “Xenozoic Age”, they discovered that many previously extinct lifeforms (particularly dinosaurs, if there was any doubt) had reclaimed the world. Dinosaurs care not for winning hands. Technology became an extremely limited resource, and those with the skill to repair it were given a great deal of respect and influence. One of the main characters was one of these beings: mechanic Jack Tenrec, who had an affinity for early 20th century vehicles (especially Cadillacs, of which his was a 1953 Coupe de Ville) and converted his cars to run on dinosaur guano due to the inability to refine oil. Jack’s love interest was scientist Hannah Dundee, an ambassador from Wasoon (Washington, D.C.) who came to the City in the Sea (Manhattan) to build relations between the two cities as well as find any information she could from the preserved library archives. Hermes was an Allosaurus (called “Cutters” in this era) that Jack raised and became his loyal companion. The dystopian world was full of various criminals, politicians, scientists and inventors, each with their own goals in mind. Common antagonists for Jack and Hannah were Hammer Terhune, an overweight poacher, and Wilhelmina Scharnhorst, leader of the “Moles” that scavenge the ancient ruins under the City. There was also as a race of reptilian humanoids called the Grith. The Grith couldn’t speak in a human language and had to communicate using Scrabble tiles. They could also communicate telepathically with dinosaurs. 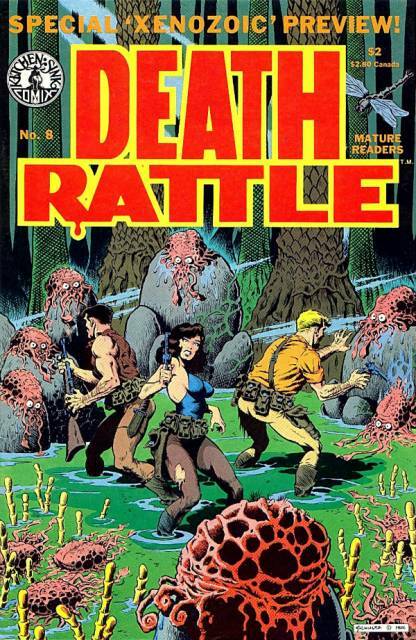 The world of Cadillacs first appeared in 1986 in Death Rattle #8; a horror anthology published by Kitchen Sink Press. 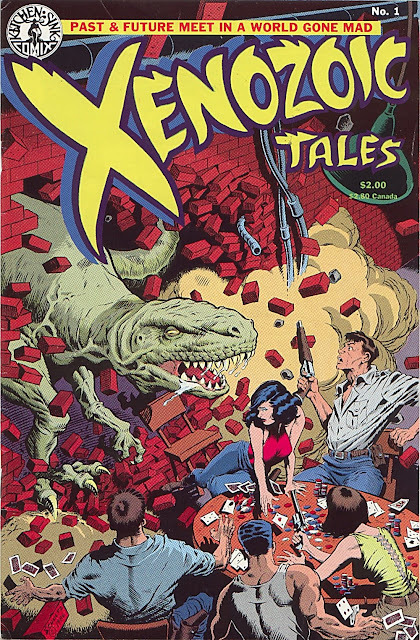 The story was spun off into its own series, Xenozoic Tales, in 1987. 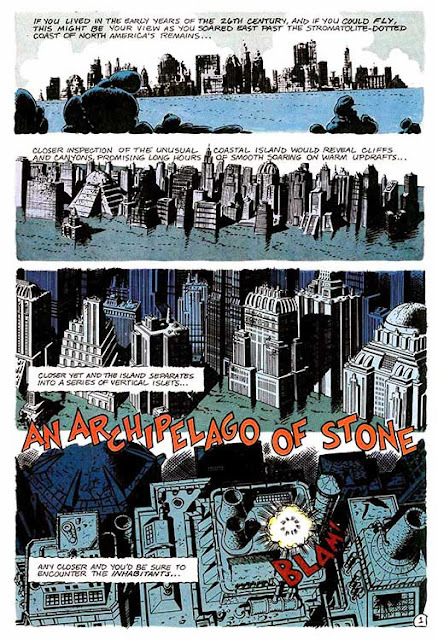 Because of Schultz’s perfectionism, a monthly schedule was never kept and the series only reached 14 issues by 1996 where it ended in the middle of a story. Each issue had two adventures: the first starring the main characters, and the second was a glimpse into the life of a citizen of that world. The series was well-received, racking up four Harvey Awards and three Eisner Awards. 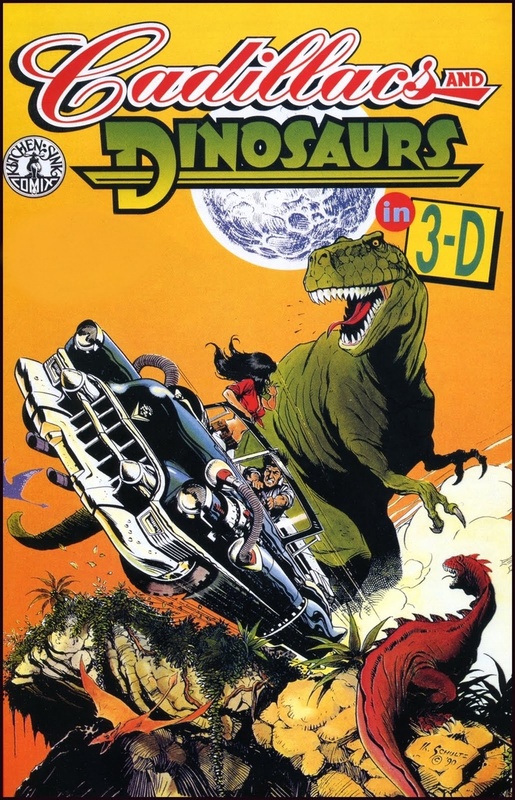 The potential for the series to become a media franchise was there, leading to the courting of Hollywood to turn it into a movie. Galaxy Films came on board and offered the suggestion of slowly building up the franchise with the public before adapting it into a film with things like toys, games and maybe even a cartoon series. 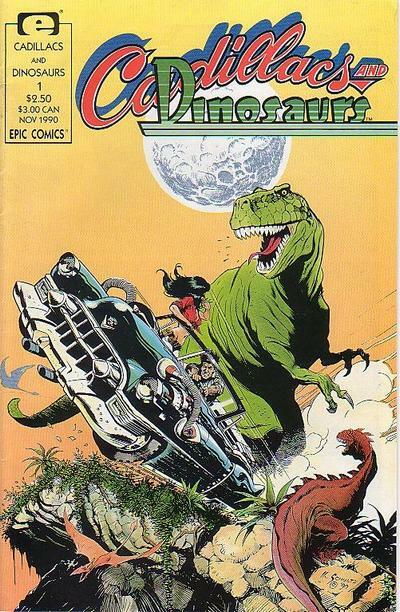 They also suggested using the tagline from the second issue, “Cadillacs and dinosaurs”, as the new title for marketing purposes (which required a licensing deal with General Motors). It was under this title that Marvel Comics would reprint the first six issues colorized with new covers through their Epic imprint. Arcade game poster featuring Mustapha, Jack, Hannah and Mess. In 1993, Capcom adapted the comic into a beat ‘em up arcade game. The game followed a condensed version of the comic’s story and allowed up to three players. Jack and Hannah were amongst the playable characters, as was their friend and engineer, Mustapha Cairo, and Mess O’Brandovich, a character who only appeared briefly in the comic. The game was generally well-received in several markets. Screenwriter Steven E. de Souza, who was involved in the production of the game, saw potential in the series and acquired the TV rights to the comic. Through his de Souza Productions and Nelvana, the comic’s story was adapted for animation. The show followed the same basic premise as the comic, following Jack (David Keeley) and Hannah (Susan Roman) on their adventures in the dangerous new world. Joining them from the outset was Mustapha (Bruce Tubbe), who already worked at Jack’s fortress-like garage as its sole employee. Unlike the comics, Jack was toned down considerably; reduced to merely being slightly grumpy than being the guy who regularly had to beat on his employees (there was more than just Mustapha) to keep them in line and loyal. He also preached the philosophy of the Old Blood Mechanics: “Machinatio Vitae”, which embraced technology with a respect for nature. The show took a decidedly larger pro-social ecological standpoint. Hobb (Don Francks), a Grith shaman, often appeared in Jack’s mind to offer him guidance and to keep him on the Mechanics’ path when he faltered. The primary antagonist of the series became Governor Wilhelmina Scharnhorst (Dawn Greenhalgh). She was just one of a council of three ruling over the City, including Governor Dahlgren (Kristina Nicoll) and Governor Toulouse (Philip Williams). Scharnhorst wanted the best for the City, but felt that meant having to discredit the Mechanics—especially Jack—and to plow through nature so that they can expand. She frequently hired poacher Hammer Terhune (Ted Dillon) and his gang to achieve her goals in exchange for the technology she could supply with the help of mad scientist Fessenden (John Stocker). 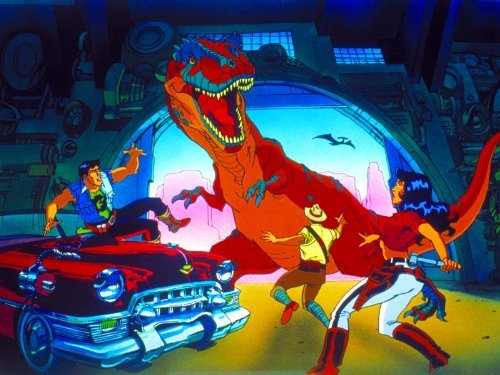 Cadillacs and Dinosaurs debuted on CBS on September 18, 1993. de Souza himself wrote the first episode, introducing the world and characters to the viewers which was largely an adaptation of the first Xenozoic story. In fact, several episodes were based on the actual issues or a combination of several issues and took on a serial format; gradually introducing and expanding on elements of the universe instead of dumping it all on the audience at once. David Wise wrote five of the episodes, one of them in partnership with Harlan Ellison. He served as one of the story editors along with fellow episode writers Dennise Fordham and Martin Pasko. Executive producer Herbert J. Wright and comicbook creator Marv Wolfman also wrote episodes, as did veteran animation writers Ted Pederson, Marty Isenberg, Robert Skir and Michael Reaves. Kitchen Sink publisher Denis Kitchen served as the show’s creative consultant and John Tucker was the series’ composer. The series, unfortunately, didn’t run beyond its single season of 13 episodes and cancelled any further plans to develop the media franchise beyond a second video game, The Second Cataclysm, released for Sega CD and PC. Tyco was awarded the license to produce the toys based on the show and released a single wave of vehicles and figures. Jack and a variant, Hannah, Mustapha, Hammer and Vice all received figures, as did Hermes and three generic dinosaurs. Jack’s Cadillac and Glider and Hammer’s bike were the vehicles. A playset based on Jack’s garage was advertised but never saw production. In promotion with the toyline, Kitchen Sink published a special run the first issue in both its original form and in 3-D as a giveaway at Toys R Us. While a million copies were published, the comic has become hard to find. 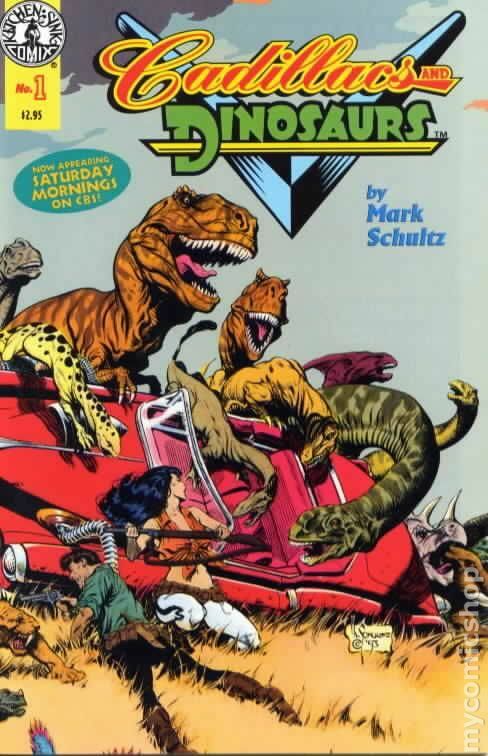 In 1994, Topps Comics began publishing with input from Schultz their own series of Cadillacs and Dinosaurs comics set between moments of Xenozoic Tales #10. This run is often mistakenly attributed as a continuation of the animated series, however while the show did influence the resurrections of some characters that died in the pages of Xenozoic, it was actually a part of the original comics continuity. Sony Home Video released a VHS with “Rogue” and “Dino Drive” on it in 1994. 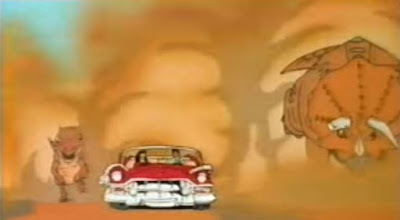 United American Video released six more episodes between two tapes in 1998. The series was made available for streaming on Amazon Video, Shomi (until it was shut down in 2016), and on the Nelvana Retro (now YTV Direct) channel on YouTube. The series also ran for years on HBO Family in Latin America in both English and Spanish. “Rogue” (9/18/93) – Hannah’s trip to the City in the Sea is interrupted by a meeting with Jack, who tries to stop a shivet from causing the destruction he gets the blame for. 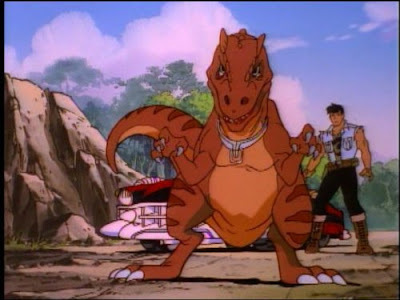 “Dino Drive” (9/25/93) – Jack tries to protect a herd of macks causing destruction by promising to move them to a safe area. “Death Ray” (10/2/93) – Scharnhorst has Jack take a scientist to a building she claims will power the city, but Jack believes she has sinister intentions for the satellite controlled there. “Siege” (10/9/93) – Hammer decides to bring the fight to Jack and attempts to conquer his garage. “Wild Child” (10/23/93) – Jack and Hannah attempt to return a wild child to the Grith, but Hammer kidnaps the boy first. “Mind Over Matter” (11/6/93) – Scharnhorst has a lab dug up from the bottom of a river in order to get at the secrets within. “Survival” (11/20/93) – Scharnhorst has a dangerous railroad car dug up while a man from Jack’s past hunts him and Hannah. “It Only Comes Out at Night” (11/27/93) – Jack and Kirgo investigate the disappearance of several moles and Kirgo ends up abducted. “Remembrance” (12/11/93) – Jack and Hannah unearth an android created before the upheaval, and Scharnhorst wants the android’s vast library of technical knowledge. “Pursuit” (12/18/93) - Jack is accused of the theft of a piledriver, but he escapes capture in order to pursue Hammer and prevent him from turning the piledriver into a poaching weapon. “Departure” (1/14/94) – When Hannah’s early-warning system for the city is shut down, she puts in for a promotion that will take her back home. 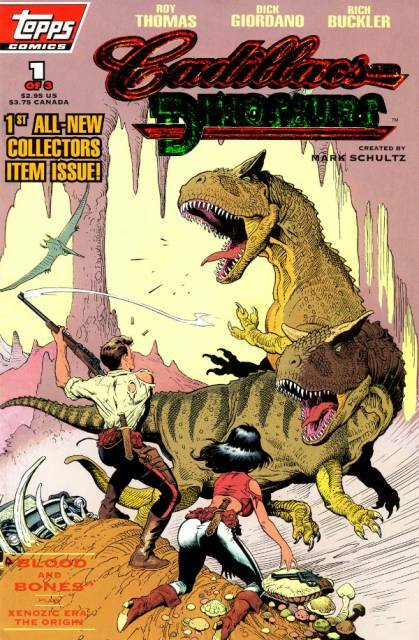 “Duel” (1/21/94) – Jack’s childhood friend comes back into his life, but he soon learns that his friend had stolen a life-preserving crystal from the Grith in order to corral dinosaurs for poaching. “Wildfire” (1/28/94) – Jack and Hannah find themselves having to join Scharnhorst in helping her prevent a jungle fire from reaching her gas wells.